When you create a folder, you are prompted to connect the folder to your online accounting. If you have not done so, please connect the folder to your Quickbooks online so you can proceed with the data export. By default, your Folder will export the data to Purchases - Bills (or Sales - Invoices). You can change the export destination in the document detail. 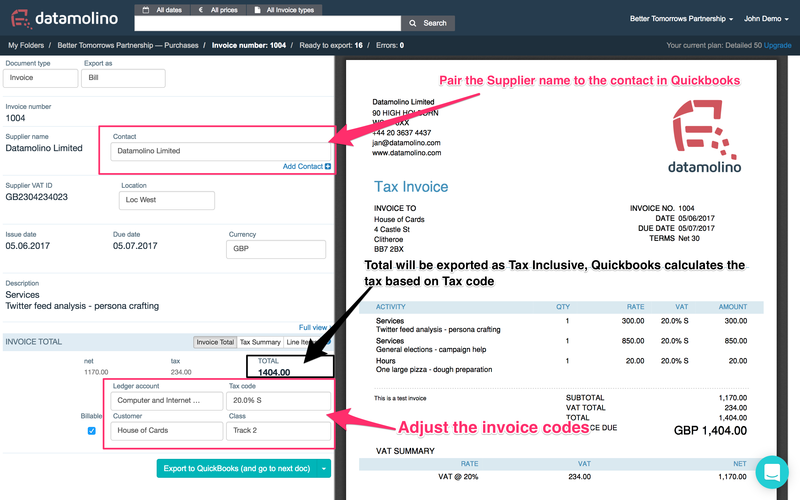 When you export a document for the first time into Quickbooks Online, you need to pair the supplier names on the invoices with your contacts in Quickbooks Online. Datamolino remembers the pairing for future use. This is necessary so Datamolino does not create contact duplicates in your online accounting. You can pair the supplier name with the supplier contact in the invoice detail by clicking on the dropdown next to the supplier name. You can also create a new supplier contact directly from Datamolino by clicking on “create a new contact” under the drop-down menu. All drop-down menus are searchable for your convenience. To finalise the export just select the “ledger account” and “tax code” and if needed your "tracking categories". Click "Save Changes" and then the “Export to Quickbooks” button to send the data to your QBO company. Please note that Datamolino will send the “Total” of the invoice and calculate the tax amount based on the "tax code" that you have selected. Datamolino will remember the “supplier name/ledger account/tax code/tracking categories” combination and suggest it to you the next time you import invoices from the same supplier. This means that the “hard work” of choosing the coding happens only for the first time in the folder, on the next export you only need to review the settings and adjust only when necessary. COMING SOON: We will implement our "Supplier Automation" dashboard for Quickbooks Online. 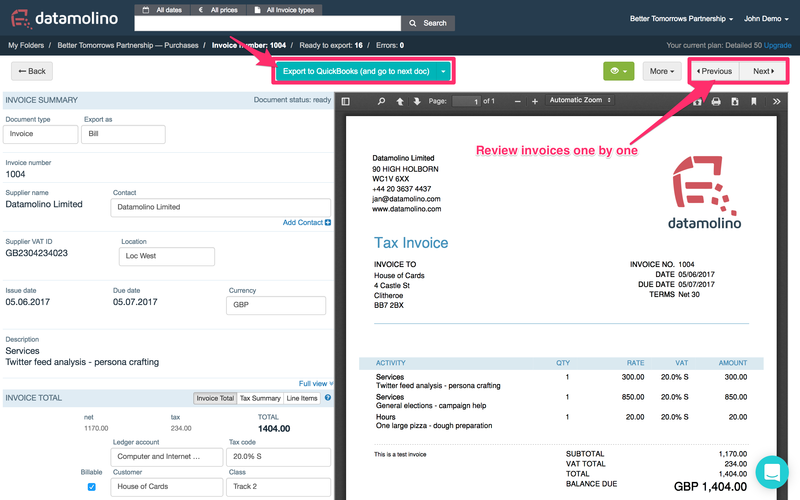 You can review the invoices one by one and export as you go. This is preferable if you suspect there could be OCR based errors in the data due to invoice image quality. Just click on the first invoice in the invoice list, review the data in the invoice detail, adjust the coding and click export if everything is OK.
Alternatively, you can export multiple invoices at once. From the invoice list in the folder, just click the checkboxes next to invoice you want to export. You can also click the checkbox on the top left to select all invoices on the page. 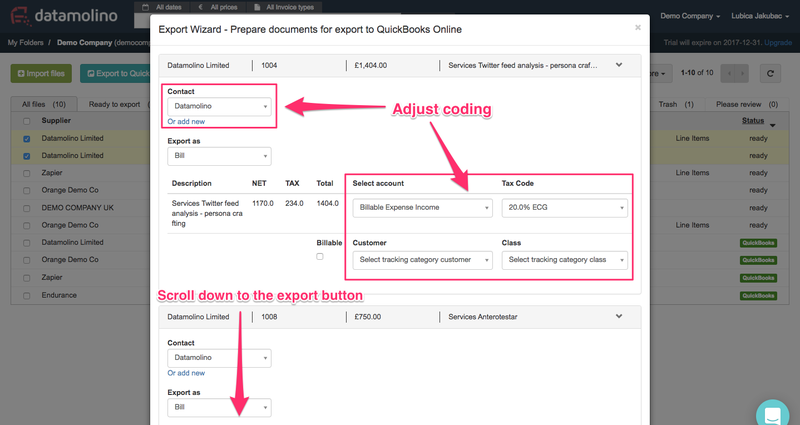 When you click “ Export to Quickbooks” an export pop-up window will appear that will let you adjust the “contact/ledger code/tax code/tracking categories” for each invoice and export multiple invoices at once. This is a good choice if you know the extracted data to be correct and do not need to adjust the figures or invoice descriptions. Our clients usually prefer this method of export for supplier invoices that have been uploaded as digital PDFs or where the scan quality reliably gives good results.